Imagine that you are one of those people for whom the concept of disc brakes for road or cyclocross bikes was just so brilliantly and immediately correct that you had to go jump on the bandwagon even before it’s established some momentum. You’ve had a bike with cable-actuated brakes for a while, but the braking performance has never quite lived up to the standards you’ve experienced with mtb hydraulic systems. Now SRAM and Shimano are introducing hydraulic dropbar systems with integrated 11sp shifting. Hurray for hydraulics…..pity that you can’t put that 11sp cassette on your existing wheels. Here you were hoping to go to hydraulic with minimal prerequisite changes to other components; now not only do you need to replace the whole component group but also your wheels. In my mind I see a Chris King cx-disc wheelset built with the ISO Disc hub (non-11sp), collecting dust in the corner because it can’t be used with the 11sp drivetrains. That would be a crime. But fear not, I have 3 options for hydraulic disc brakes for your road or cyclocross bike that allow you retain your 10sp drivetrain, or at least let you keep your wheels. The first option is the best for 10sp SRAM users. Although SRAM’s marketing push for Hydro-R disc is in conjunction with Red22 (11sp), they do in fact make hydraulic integration available in 10sp as the non-series, S-700 Hydro-R. These levers and calipers are of the exact same shape and function as the Red22 versions, but with less carbon bits and more aluminium. Also, the brake pads are backed with a steel base instead of titanium. The levers are compatible with 10sp front and rear derailleurs, so other than levers and brakes, you could keep all your other components. You get all the functionality of the more expensive Red22 with a little more weight. Cost for a set of S-700 levers, rotors, calipers, and hoses is about US$800. 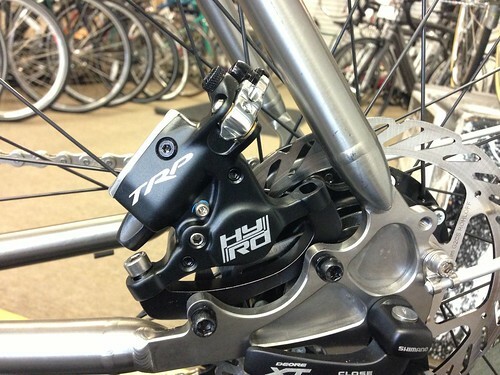 Another option is the TRP HyRd caliper. This is a hybrid mechanical/hydraulic system that works with standard brake cables and dropbar levers. The open-system hydraulics are exclusively within the caliper itself; a master cyclinder sits atop the dual piston caliper. As a hybrid brake, the open-system hydraulics allow the psitons to automatically compensate for brake pad wear. The HyRd doesn’t require slicing hydraulic hose or rebleeding for installation, making the process much easier and consumer friendly. The caliper is somewhat bulky but the weight is roughly comparable to Avid BB7 mechanical calipers. From brief personal experience, the brakes are powerful with great modulation when combined with premium, “compression-less” brake housing. As long as the cable and housing stays smooth, these brakes should maintain a brake feel almost indistinguishable from full hydraulic systems. The TRP HyRd largely replaces the previous Parabox hybrid system. The Parabox housed 2 master cylinders in a “box” clamped to the steerer below the stem. Standard brake cables feed from the stem to the master cylinders; these in turn drive dual-piston hydraulic calipers (derived from TRP’s mtb systems). Scuttlebutt on the Parabox is that it doesn’t modulate well and is tedious to setup correctly, since you are essentially installing 2 complete brakesets on the same bike. The HyRd could be retrofitted in minutes to any bike with mechanical discs already. One last option exists for riders who are ready to buy a new disc brake gruppo but already have wheels that won’t fit the 11sp cassette. I’m thinking about that King wheelset again. Well, if you don’t have much use for an 11T cog, I may have a solution for you. 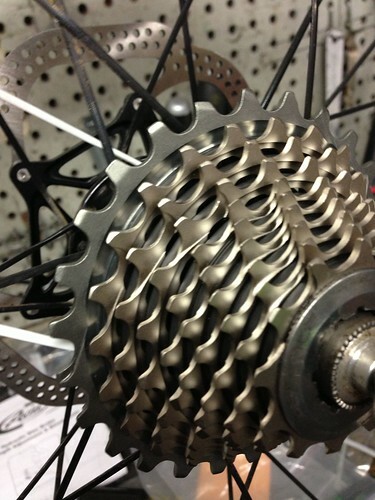 If you remove the 11T cog (1st postion) from the 11sp cassette, the rest of the cassette will fit a 10sp cassette body. 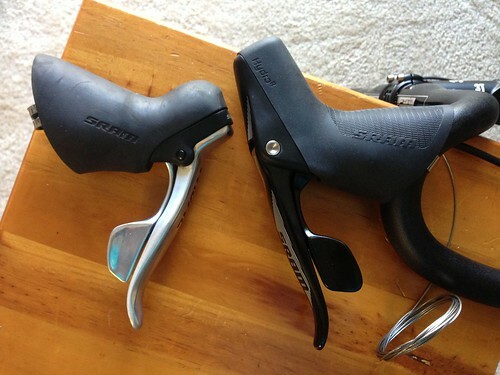 Then you just have to adjust the derailleur so you only use the first 10 of 11 index clicks on the right hand shifter. I have done this for Red22 11sp and I suspect it might work even better when Shimano releases their 11sp Di2 hydraulic levers. You will probably need to replace the lockring that came with the 11sp cassette (all of which have 11T first position cogs) with a lockring meant to fit a 12T cog. You will also need to add a really thin spacer to the cassette body to take up the extra room left by the reduced 11sp cassette. Keep in mind that the reason you are using a reduced 11sp cassette is that the 11sp shifters and derailleurs will want to match up to the 11sp cassette’s cog-to-cog spacing. This isn’t the same as trying to use an 11sp drivetrain with a regular 10sp cassette, which has wider cog spacing. I know that many riders consider the 11T indispensible for some reason, but road bikes did exist for at least 90 years without an 11T cog. Personally I will never need a 11T cassette if my big ring is 52T or 53T; my high cadence means that I can spin 12T when others might need the 11T . But I run 42T or 44T rings on my cyclocross bikes, so I could occasionally spin out a 42x12T on a race course. Personally, I think the whole 11sp industry move has nothing to do with consumer need and all to do with marketing. Shimano didn’t have the confidence to build premium road components with one less cog than Campagnolo, and SRAM certainly couldn’t stand by as the only one without 11 speeds. Consumers get a 16T cog along with thinner, less durable, and more expensive cogs/chains. It is true that the new 11sp levers generally shift better than their 10sp predecessors, but that is due to the 11sp levers having improved shift mechanisms. The same level of refinement could have certainly be applied to 10sp platforms. I plan to use 10sp for as long as I can, or at least until some immensely attractive innovation is integrated as an 11sp system. For the moment, you don’t have to go 11sp in order to get hydraulic disc brakes.